Pedersoli sells the rear sight for their Officer's Model. It differs from the original ones in that it is windage adjustable. Go to trapdoorcolletor.com and and ask the forum for the correct location. Last edited by varsity07840; 09-16-2018 at 07:07 PM. The Officer's Model wasn't issued with a rear open/iron sight; but the upper rifle below is a non-officer's Model H&R trapdoor with barrel sights for you to judge the correct position. This is the H&R rear sight - a ladder sight with protective ears. Some years back I picked up an H&R OM which only had the rear tang sight but did not have a barrel mounted rear sight. Original OMs from Springfield Arsenal had rear barrel mounted sights. As I was well familiar with the various rear sights on original TDs got a M1879 Type III "R" rear sight and mounted it on my H&R OM. I had access to two original OMs and found the rears (two different rear sights; M1873 and M1879) were not the same distance from the front of the receiver ring. I surmise this was because the sight blade is at the front of the M1873 sight and at the rear of the M1879 sight. I decided to use the spacing of the OM with the M1979 rear sight since that's what I was using. I believe Pedersoli sells both a repo M1873 and a M1879 rear sight. I suggest the M1879 rear sight as it has much finer elevation adjustments and is has windage adjustments also. 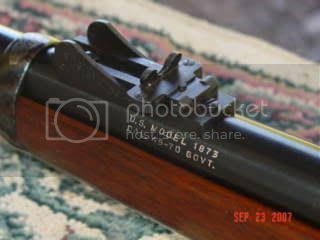 If Pedersoli doesn't make one then I suggest finding and original "R" (Rifle) M1879 rear sight, Trapdoorcollectors.com is a good place to look. If you get that rear sight then I can tell you how far in front of the receiver to mount it. Original OMs also had Beech front sights so I also replaced the front sight on my H&R OM with one. A Beech front sight of .400 from the bottom to the top of the post is the correct height for use with the M1879 rear sight. I also located a repo grip adapter (2nd gen) and installed it. That gives as close as possible OM that I shoot a lot. I shoot a lot of M1873 equivalent smokeless service loads (400 - 405 gr cast at 1350 fps) in my OM out to 1000 yards. I mostly use the M1879 rear sight instead of the tang sight. They never made a rear sight specifically for the sight radius of the OM. Thus with such "service" loads the "R" M1879 rear sight is easily regulated using the "Point 8 Rule". That is simply the distance to the target X .8 = the rear sight range setting. On my OM using the blade front sight (I use the bead front sight with the tang rear sight) a 6 o'clock hold on a 6" bullet at 100 yards puts the POI in the center of the bull. The "Point 8 Rule works perfectly out to 1000 yards as mentioned. Be prepared for a thumping off the bench with service loads. Nice rifle but it's very light.